Home prices throughout D.C. have increased tremendously since the mid-1990s, but the ascent in home prices has not been steady; in much of the city, home prices peaked in 2006 near the height of the housing boom, fell, and then started to rise again several years later. But not all neighborhoods had the same experience. The exact trajectory of home prices and the level of home prices today versus at the peak of the housing boom, varies quite a bit by neighborhood. Below are some interactive graphics we created that illustrate the trajectories of home prices from 2001 to 2015 in different D.C. neighborhoods. In the first map, below, you can see that home prices in all of D.C.’s neighborhoods have increased since 2001, but the largest increases have occurred in city’s central corridor. The map below shows that neighborhoods in the city’s central corridor also better weathered the housing boom and bust than neighborhoods closer to the city’s borders. The median sales price of a single family home has decreased since 2006 in all neighborhoods east of the Anacostia River, in neighborhoods along the city’s northern border, and in some neighborhoods west of Rock Creek Park. Home prices declined after the housing boom, but in 2009 prices started rising in many D.C. neighborhoods, though not in all. The neighborhoods that saw the biggest price increases since 2009 are those to the northeast of downtown: Trinidad, Eckington, Brookland, LeDroit Park, and Petworth, as you can see in the map below. Even though home prices in the city’s central corridor have increased the most over the past 15 years, median prices for single family homes west of Rock Creek Park still tend to be higher than in other parts of the city. You can use the map below to see how home prices in each D.C. neighborhood have changed since 2001. You can download the data for this analysis here (click the download button in the bottom right corner of the Tableau graphic). Home price data is the median sales price for single family homes from 2001 to 2015. The 2015 data includes homes sold through 11/30/2015. This data is from the D.C. Recorder of Deeds. We adjusted for inflation and converted all home sale prices into 2015 dollars using the Bureau of Labor Statistics inflation calculator. We did not control for house size in our analysis. The neighborhoods we use in our analysis are the city’s assessment neighborhoods for property taxes. We got the neighborhood boundaries from D.C.’s Office of the Chief Technology Officer. 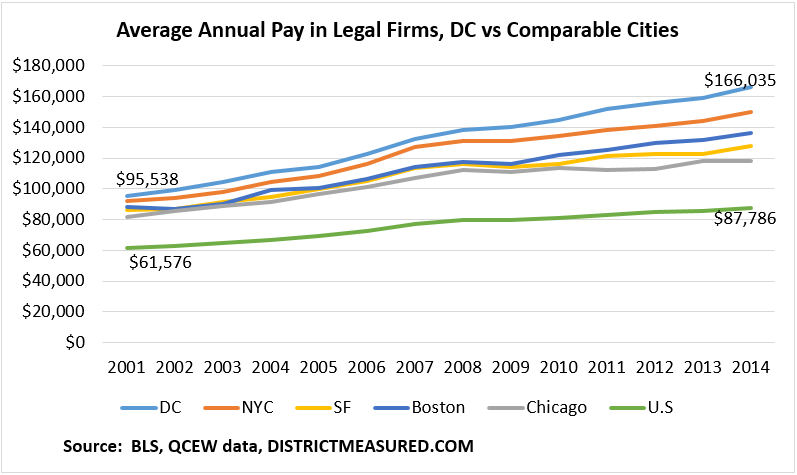 In 2014, nearly 774,000 workers reported working in the District of Columbia and they collectively earned $63.5 billion in wages and salaries. Of these workers, only 251,000 or 32 percent were District residents. The remainder were commuters from Virginia or Maryland, accounting for 68 percent of people employed in our city. The District’s share in total wages earned was even lower: District residents accounted for $18 billion of salaries and wages earned in the District. This is about 28 percent of all wages and salaries earned in the city. In addition 89,000 District residents reverse-commuted to Virginia and Maryland, mostly working for private entities (76 percent including non-profits) and the federal government. This group collectively earned $6 billion in wages, compared to the $45 billion Maryland and Virginia commuters earned in the District. The data reveal other trends. 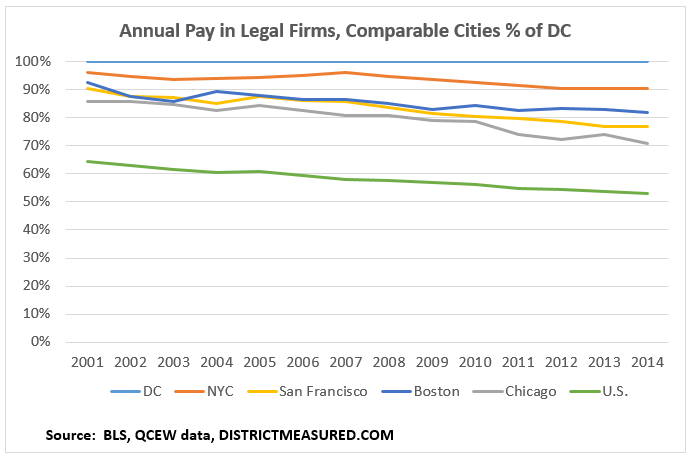 District residents who work in the District hold a disproportionate share of the lower-paying jobs: 44 percent of jobs that pay a wage of $30K or less are held by DC residents, compared to 32 percent of all jobs in the District. Virginia residents, on the other hand, tend to hold a larger proportion of higher paying jobs: 28 percent of jobs in the District and nearly 40 percent of all jobs that pay $100K or more. The data also show that District residents dominate employment in the non-profit sector, one of the lowest paying sectors in the District. Commuters from Virginia and Maryland, on the other hand, typically come to the District to work in the private sector and the federal government. 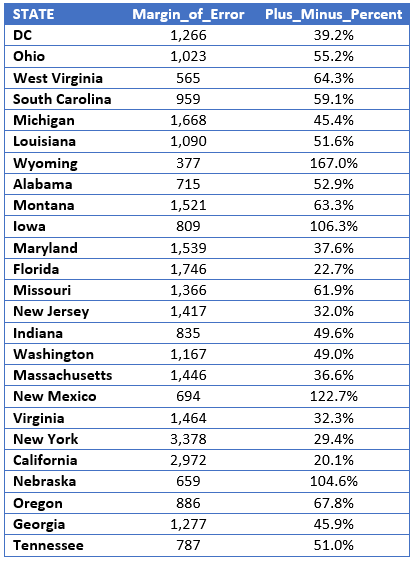 The data is from the single-years PUMS release from American Community Survey for 2014. The analysis was done in SAS, and SAS files are available from the author.